So if you've been following me on Twitter today you know I spent this morning with a horde of current and retired pro athletes. 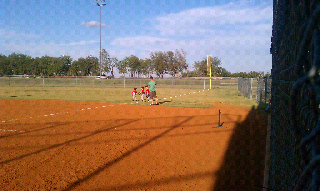 Now I am sitting in the bleachers getting ready to watch my two big boys play t-ball. Later tonight I'll get a full post up about the Team Escalade Texas event this morning....for now I've got to concentrate on my two favorite ball players.